Airmen with the 1st Aircraft Maintenance Squadron prepare to taxi F-22 Raptors at Nellis Air Force Base, Nevada, Jan. 18. The aircraft assigned to the 1st Fighter Wing from Joint Base Langley-Eustis, Virginia, conducted air combat training sorties with various aircraft, including the F-35A Lightning II during Red Flag 17-1. NELLIS AIR FORCE BASE, Nevada — The 1st Fighter Wing’s aircrews and support personnel out of Joint Base Langley-Eustis, Virginia, arrived at Nellis Air Force Base Jan.17 and 18, to participate in Red Flag 17-1, as the exercise’s core unit. 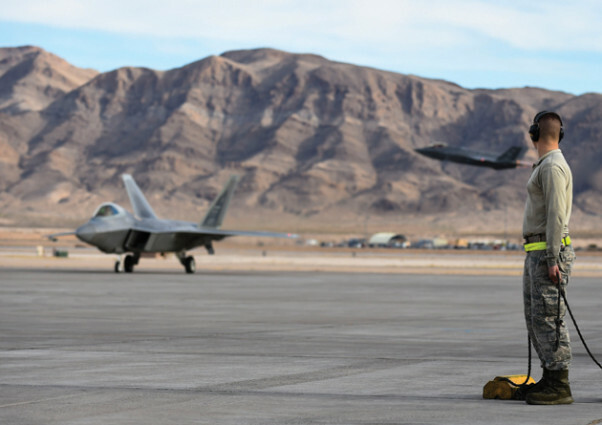 Red Flag, a three-week combat training exercise involving U.S. and allied forces’ air, space and cyber domains, kicked off Jan. 22, on a simulated battlefield over the skies of the Nevada Test and Training Range north of Las Vegas. Throughout the training exercise, Airmen support their units in defeating aggressors including realistic threat systems and opposing enemy forces, providing all domains the ability to train collectively for contingencies in a safe environment to increase the combat capabilities for any future combat situation. According to Master Sgt. 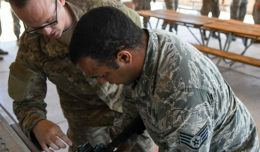 Erick Matos, the Red Flag 17-1 superintendent, as the exercise’s core unit, the 1st FW has the added challenge of not only conducting its own air-to-air and cyber mission taskings, but also supporting Red Flag’s U.S. and allied forces. 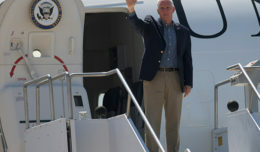 “We are ensuring over 30 different units and over 3,000 individuals form not only the U.S., but partner nations like the United Kingdom and Australia as well as our sister services have all the resources they need and require to learn and execute the best way of employing a combined large-force package in a live-fly environment,” Matos explained. Siverio anticipates that facilitating successful countering of air, space and cyber threats by all participating units will take a team effort lead by the 1st FW. 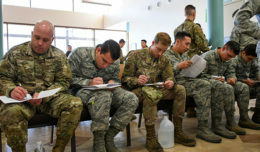 “We’re here as a core unit to help all other participating units by lending our expertise and ensuring they have all the necessary resources they need to meet the objectives set out by Red Flag staff and their respective units,” Siverio said, adding that such groundwork can range from augmenting core members to fill duty gaps and tasking other to units to achieve exercise needs. For Matos, succeeding as the core unit is simple; ensure all duty requirements are met and support wherever help is needed.